"You are about to begin reading Italo Calvino's new novel, If on a winter's night a traveller. Relax. Concentrate. Dispel every other thought. Let the world around you fade. Best to close the door; the TV is always on in the next room. Tell the others right away, "No, I don't want to watch TV!" Raise your voice - they won't hear you otherwise - "I'm reading! I don't want to be disturbed!" Maybe they haven't heard you, with all that racket; speak louder, yell: "I'm beginning to read Italo Calvino's new novel!" Or if you prefer, don't say anything; just hope they'll leave you alone." 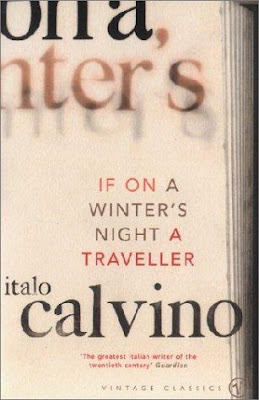 About the book: If on a Winter's Night a Traveller is a 1979 novel by Italian author Italo Calvino. It is translated into English by William Weaver in 1981. Summary: You (yes, you) go to a bookshop and buy a copy of Italo Calvino's If on a Winter's Night a Traveller. You start reading it, but you realize there is an error. You find the first chapter very exciting, but the book ends there. The book is incomplete, and you exchange it for what you assume to be a complete copy of the same book. Soon, when you read it, though, you realize it's a completely different book. This goes on for quite a while (every even chapter is a different book and every odd chapter is you reading it) and you never finish reading any of the books. Except for If on a Winter's Night a Traveller, which does eventually end, and you do finish reading it! My thoughts: A book about reading starring... me? I was glued to it. I have never really read a book in second person perspective and I certainly didn't imagine it to be so much fun. It is the most annoyingly witty and interesting book I have ever read. The book had a lot of underlying themes, mostly writing, writers and readers; the book business, media and frauds; all dealt with in a subtle but hilarious manner. It is a wonderful read! Whoa, the summary alone blows my mind. I've never read a book in second person perspective like that and it throws me off a little. Wow, that's an impressive introduction! Thanks for sharing...and for visiting my blog. That is a great way to begin a novel, really different from anything else I've read. Wow.. I am entering this one to my must read list. Katy - The perspective takes a little while getting used to, but once you do, it is pure fun! Harish - Do read it, it's unique and quite a short read!